An injured Palestinian boy was kidnapped at daybreak Thursday after the Israeli occupation forces broke into the Duheisheh refugee camp, south of Bethlehem province. Local resident Emad Shaheen said the occupation forces wreaked havoc on the family home of his injured nephew Hussein Shaheen, 16, after they blew up the entrance gates. 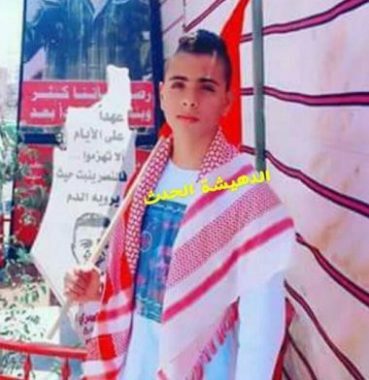 The break-in culminated in the abduction of Hussein, who has reportedly been enduring excruciating pains as a result of an injury inflicted by Israeli bullet fire in December after he was shot in his feet with three bullets. 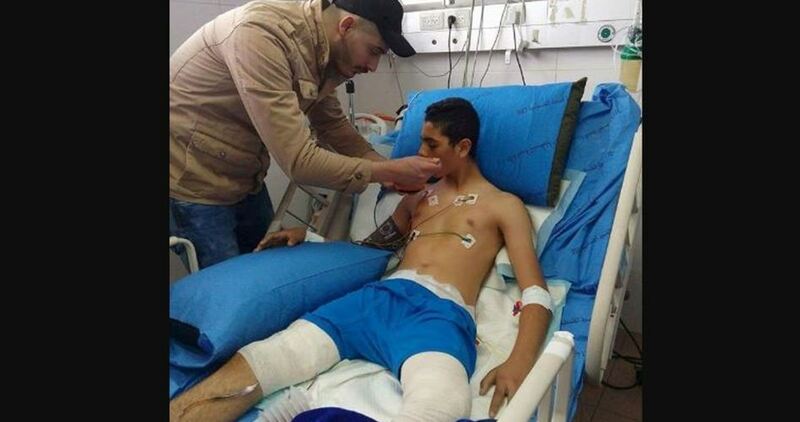 Hussein had his artery severed and underwent a surgery to save his life. Israeli soldiers also attacked Hussein’s family members using sniffer dogs. Shaheen said he told the Israeli occupation forces about the minor’s critical health condition but they paid no heed. At the same time, a number of Palestinian protesters sustained live bullet wounds and others choked on teargas fired by the Israeli military all the way through the assault. Palestinian anti-occupation youth responded to the attack by hurling stones and empty bottles at the heavily-armed occupation patrols. 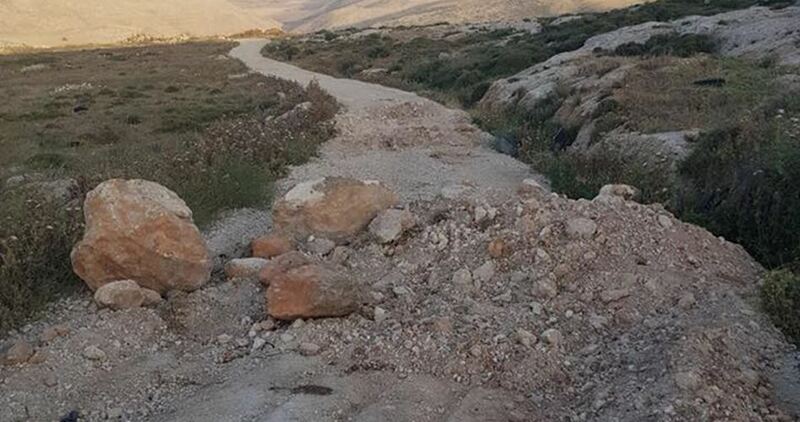 The municipality of Aqraba town, southeast of Nablus, has reported heavy losses after the Israeli authorities decided to close the road leading to the town’s landfill and confiscated vehicles used for transporting the waste. According to informed sources, the municipality has incurred losses of about 97,400 shekels so far. Local sources reported that the Israeli occupation authorities issued an order six months ago banning the use of the waste dump by the municipality. A week ago, they blocked the road leading to the site with sand berms. Aqraba municipality called on the Red Cross and human rights organizations to intervene and pressure the Israeli authorities to reopen the landfill which has been owned by the municipality for 24 years. The Municipality said that the landfill is located in an empty area and there are no residents affected by the garbage dumped there. Senior Hamas official Abdul-Hakim Hanini said that Palestinian Authority (PA) chief Mahmoud Abbas did not only take punitive measures against his own people in Gaza but also in the West Bank through arresting hundreds of its finest sons. In press remarks, Hanini stated that more than 200 citizens, mostly university students and ex-detainees released from Israeli jails, had been arrested for politically motivated reasons in the West Bank since Abbas’s speech on March 19. He described the escalating political arrest campaign in the West Bank as part of the policy of exclusion, monopoly and mass punishment pursued by the PA leadership against the Palestinians and their political forces in the West Bank and Gaza. The Hamas official called on all concerned local and international institutions to investigate the detention of citizens illegally in the West Bank and release reports in this regard. 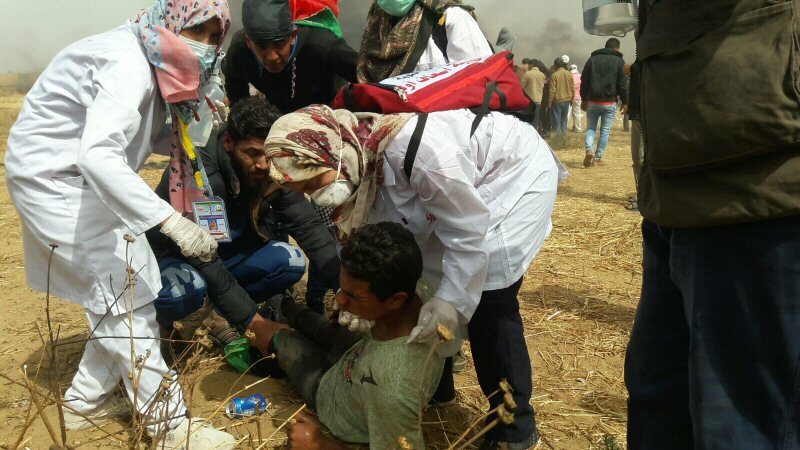 21 wounded citizens underwent amputations in the Gaza Strip due to severe bullet injuries they suffered during their participation in March of Return protests, which have been taking place recently in different border areas. According to the health ministry in Gaza, four of those wounded citizens had amputations in their upper extremities and 17 others in their lower parts as a result of their exposure to live fire by Israeli soldiers. Israeli soldiers’ use of live ammunition to attack March of Return protesters in Gaza has rendered 42 Palestinians dead and over 5,000 others wounded since March 30. The latest US annual report on human rights violations, released last Friday, carried an intentional omission. There is no longer any mention of the occupied Palestinian territories. In a move which normalises Israel’s colonial project and military occupation yet further, the relevant entry reads: “Israel, Golan Heights, West Bank and Gaza”. There is no doubt that US President Donald Trump has supported Israel overtly, exposing the policies of previous administrations which maintained a more calculated, covert approach. With the unilateral declaration of Jerusalem as Israel’s capital and the forthcoming move of the US Embassy from Tel Aviv to the Holy City, the US has set new precedents in normalising colonialism. In doing so, it has encouraged other countries supportive of Israel to follow suit, or declare such intentions. Yet, there is an earlier precedent which was met with derision rather than preoccupation. When Trump failed to uphold the distinct and internationally accepted two-state paradigm, the media was more concerned with his lack of eloquence, rather than the significance behind the admission. At best, talk of a one-state solution was brought forward tentatively, albeit with little attention as to how the concept can be misinterpreted. Associating a one-state concept with equal rights for Palestinians prevailed. However, little was said about the pitfalls of implementation within the context of a colonial entity whose concept of a state is one that eliminates Palestinians and their legitimate rights in order to maintain a Jewish identity and majority. Removing references to Israel’s military occupation of Palestine is undoubtedly damaging. There are, though, varying degrees of danger for Palestinians, including defining the military occupation without its settler-colonial context, one of the few instances where the Palestinian Authority is consistent. Both approaches reflect the normalisation of Israel’s colonial appropriation of Palestine. The complete omission as articulated by the US is just a step ahead of the PA and the international community in terms of isolating Palestinians in terms of politics and rights. If by this the PA is alluding to the apparent dismissal of the two-state compromise by the US, it should be remembered that, in the absence of a unifying anti-colonial alternative which the PA refuses to consider, there is little to indicate that Palestinians will be able to define themselves politically at an international level. This is due entirely to coercion from the coloniser and the circle of collaborators within the PA who keep insisting upon the obsolete “peace process and “two-state solution”. Meanwhile, Israel’s state violence against the Palestinians becomes the norm, and the international community led by the US is complicit. Israeli forces continued to use excessive lethal force against Palestinian civilians, who participated in peaceful demonstrations organized on the 42nd anniversary of the Earth Day, particularly in the Gaza Strip, which witnessed peaceful demonstrations along the eastern Gaza Strip border area, where ten thousands of defenseless Palestinian young men, women, children, and elderlies participated. On 20 April 2018, the Gaza Strip witnessed peaceful demonstrations where ten thousands of Palestinian civilians participated. Those non-violent demonstrations continued sporadically during the reporting period. As a result, 5 Palestinian civilians were killed and two others succumbed to their wounds; one of them was a journalist and the other was profoundly deaf. Thus, the death toll has increased to 36 Palestinian civilians, including 4 children and 2 journalists, since the beginning of the demonstrations in the Gaza Strip only on 30 March 2018. Moreover, during the reporting period, 288 Palestinian civilians, including 6527 children, 107 women, 2 journalists and 2 paramedics were wounded; 15 of them sustained serious wounds. In the West Bank, the Israeli forces wounded 1127 Palestinian civilians, including a child and elderly, in separate incidents. According to PCHR’s investigations, at approximately 13:00 on Tuesday, 24 April 2018, Israeli forces accompanied with several military vehicles and a heavy bulldozer moved into Jenin and stationed in the vicinity of al-Batikhah intersection near North Gate Hotel in al-Basatin neighborhood, north of the city. They surrounded a house belonging to prisoner Ahmed al-Qamba’a. The soldiers raided and searched the house and the engineering unit began to plant explosives in the house walls. At approximately 05:10, they blew the house, which is comprised of one floor, established on an area of 160 square meters and inhabited by 8 individuals, including 2 children. Al-Qamba’a family evacuated the house a month ago after the Israeli Supreme Court rejected the appeal submitted by the family to stop the demolition order signed by the Israeli forces Commander in the West Bank. It should be noted that the Israeli forces arrested the abovementioned civilian and accused him of participating in the attack carried out by Ahmed Jarrar on 09 January 2018 near Surrah village, southwest of Nablus. The attack resulted in the death of a Rabbi. The Israeli forces widely used bursts of tear gas canisters targeting the center of the demonstrations and beyond away from the demonstrators near the border fence. As a result, dozens of civilians suffered tear gas inhalation and seizures. They were transferred to hospitals. The Israeli forces fired tear gas canisters, which fell on the field hospital and medical center belonging to al-Barakah Algerian Association in Khuza’ah and its surroundings. As a result, the medical crews were forced to vacate the hospital and center for some time, noting they are 800 meters away from the border fence. PCHR’s fieldworkers noticed that the Israeli shooting and targeting at the protesters intensified randomly at approximately 17:00 in the evening when some protestors managed to pull parts of the second barbed wires placed inside the Palestinian territories around 50 meters away from the main border fence. The shooting sporadically and deliberately continued until approximately 20:00. As a result, Sa’ed ‘Abdel Majid ‘Abdel ‘Aal Abu Taha (31) from al-Qararah in Khan Yunis was hit with a bullet to the neck at approximately 18:00 when he was around 70-100 meters away from the border fence, east of Khuza’ah in Khan Yunis. Moreover, 67 civilians, including 7 children, 2 women, 2 journalists and 2 paramedics, were wounded. Thirty-nine of them were hit with live bullets, 27 were directly hit with tear gas canisters and one civilian was hit with a rubber bullet. 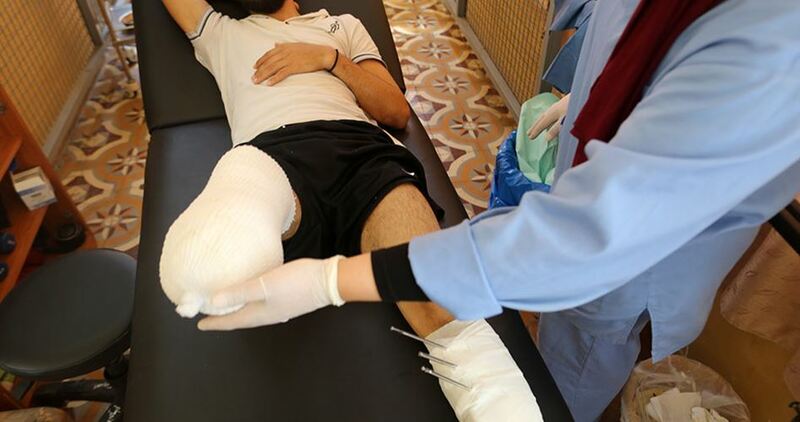 The wounded civilians were transferred to field hospitals in the camp and then transferred to Gaza European and the Algerian Hospitals in the city. Doctors classified the injury of two civilians as serious. The Syrian Coalition’s Department of Foreign Affairs on Thursday met with Cheng Weihua, Counselor at the Chinese Embassy in Ankara to discuss the latest developments on the ground in Syria, including the Assad regime’s continued bloody military campaign and the latest political developments. The meeting, which was attended by President of the Syrian Coalition Abdurrahman Mustafa, also discussed the Assad regime’s repeated use of internationally banned chemical weapons. Beijing supported the launch of UN investigations into the use of this internationally prohibited weapon and holding those responsible to account. Mustafa expressed hope for the establishment of strong relations with China and for working together to hold accountable perpetrators of war crimes in Syria through supporting the UN accountability mechanism. He said that accountability for war crimes would open the way for a real political process leading to a political solution preserving Syria’s territorial integrity. Head of the Department of Foreign Affairs, Abdul Ahad Steifo, pointed out that the Syrian Coalition and the Syrian Negotiations Commission dealt positively with the negotiating process in Geneva and sought to achieve international consensus on political solution in accordance with the Geneva Communiqué of 2012 and UN Security Council resolution 2254. He pointed out that the UN envoy to Syria Staffan de Mistura and the majority of the UN Security Council’s member states attested to the positivity that was shown by the Coalition. Steifo reiterated that the Assad regime and its backers did not show any seriousness during the latest round of the Geneva talks because of their insistence on pursuing a bloody military solution. He cited the Assad regime’s continued killings, mass forced displacement, siege, and the targeting of health facilities and humanitarian workers. 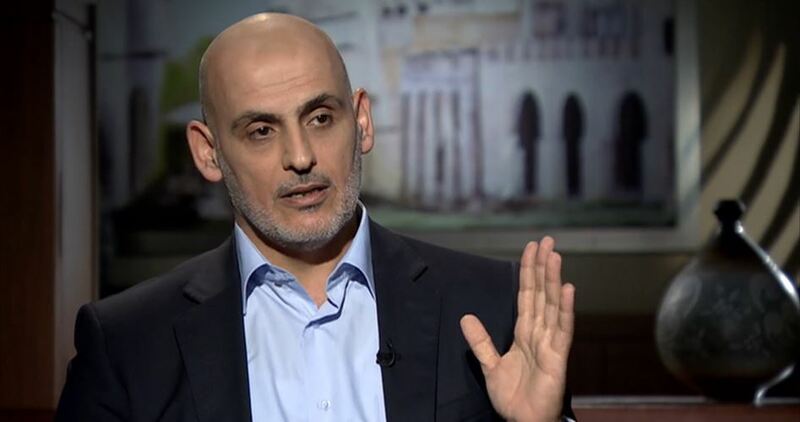 Member of the Department of Foreign Affairs and the political committee Hadi al-Bahra said that the Assad regime and its allies’ behavior does not suggest there will be a change in their military strategy. 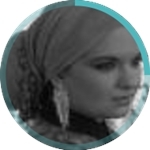 “This fact has been manifested through the continued use of brutal force against Syrian civilians and the mass forced displacement of civilians aimed at changing the demographic landscape in Syria. It has also been demonstrated by the Assad regime’s recent introduction of Law No. 10 which threatens to deprive the civilian population of their property and to prevent the displaced persons from returning to their homes,” Bahra said. For his part, the Chinese Counselor handed a letter from the Chinese Foreign Minister Wang Yi to the Coalition’s leadership, saying that the letter is a response to a previous letter from the Coalition’s President to Beijing. The letter expressed China’s keenness to preserve the territorial integrity of Syria and its belief that a political solution is the only realistic solution for the Syrian crisis. It also reaffirmed Beijing’s support for the UN mediation as it stressed that Beijing opposes the use of force in international relations and the use of chemical weapons. The meeting concluded with President Mustafa urging the UN Security Council to unanimously agree on the need to hold accountable all perpetrators of war crimes in Syria, especially the crimes of the use of chemical weapons and for which Assad’s involvement has been already confirmed. He underscored the need to refer Syria to the International Criminal Court as essential to reaching a lasting politician solution. A group of Israeli settlers attacked the village of Beit Iksa on the outskirts of occupied Jerusalem and the village of Rammun to the east of the West Bank city of Ramallah yesterday. Head of Beit Iksa’s Village Council, Saada Al-Khatib, told Quds Press that the settlers stormed the village at dawn, damaged the tyres of 20 vehicles and spray-painted racist messages on several houses and shops. The messages, which were written in Hebrew, called for the residents of the village to leave and threatened that they would be killed. Al-Khatib said that this is the fifth time extremist settlers have attacked the village during the past six months, noting that these attacks aim to push the 2,000 villagers to leave. Access to Beit Iksa is only possible through one entrance which is an Israeli military checkpoint. Local sources in Ramallah told Quds Press that a group of Israeli settlers invaded the village of Rammun on Sunday night. The settlers caused damage to many Palestinian vehicles and spray-painted racist messages on the walls of Palestinian homes. Quds Press said that this is the sixth attack on West Bank villages during the past two weeks. Price tag and hilltop extremist settler groups are known for their hate crimes against the Palestinians in the occupied West Bank and Jerusalem and sometimes in Israel. Rights groups have continually said that in most cases the members of these groups are not punished. In response to these attacks the Palestinian factions in Ramallah announced they would establish popular units to defend the Palestinians from settler attacks. The United Nations’ top envoy to the Middle East has called on the international community to help prevent another war in the Gaza Strip, as Israeli military forces continue to brutally crack down on peaceful anti-occupation rallies near the border. Nikolay Mladenov, the world body’s Special Coordinator for the Middle East Peace Process, told the UN Security Council on Thursday that Gaza had turned into “a powder keg” and that the world “must do everything possible to prevent another war” between Israel and the Palestinians. Such a military confrontation, he said, might go on to include other countries in the region. Protests along the Gaza border since March 30 have led to clashes with Israeli forces, who have killed at least 38 Palestinians and injured hundreds of others. The rally, dubbed the “Great March of Return,” will last until May 15, which coincides with the 70th anniversary of Nakba Day (Day of Catastrophe) on which Israel was created. Israel has already launched several wars on the besieged Palestinian coastal sliver, the last of which began in early July 2014. The military aggression, which ended on August 26, 2014, killed nearly 2,200 Palestinians. Over 11,100 others were also wounded in the war. Every year on Nakba Day, Palestinians all over the world hold demonstrations to mark the anniversary of the forcible eviction of hundreds of thousands from their homeland by Israel on May 14, 1948. More than 760,000 Palestinians were forced out of their homes on that day. Today, the number is estimated to have surpassed five million, including their descendants. Israel has so far denied the Palestinians the right to return to their homeland, ignoring numerous UN resolutions and international laws.